One of the first things we looked at once we had the dates and a rough outline of the route we were going to do was to consider which options we had to get to Morocco. There are more than 1,000 km of motorway to get to the ferry that crosses the Gibraltar strait, too much to ride on one day. The first alternative we considered was the ferry from Barcelona to Tangier – it would save us a long ride, petrol, tolls, tires… but unfortunately the ferry does not operate every day, and there was no ferry available for our departure day, the 26th of December. 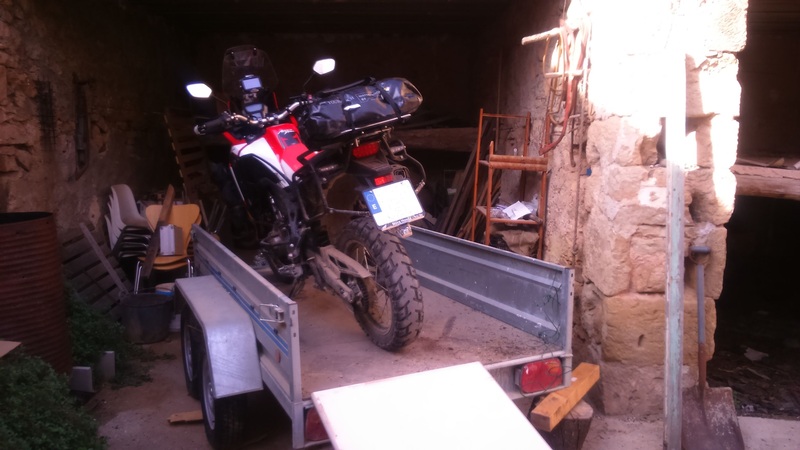 The second alternative was to put the bikes on a trailer and drive to Algeciras. We would be able to take turns at the wheel, reducing fatigue and pay fuel and tolls only for one vehicle. It sounded like a good plan, if it were not for a couple of details – one, we did not have a trailer; two, none of our cars had a trailer hitch. 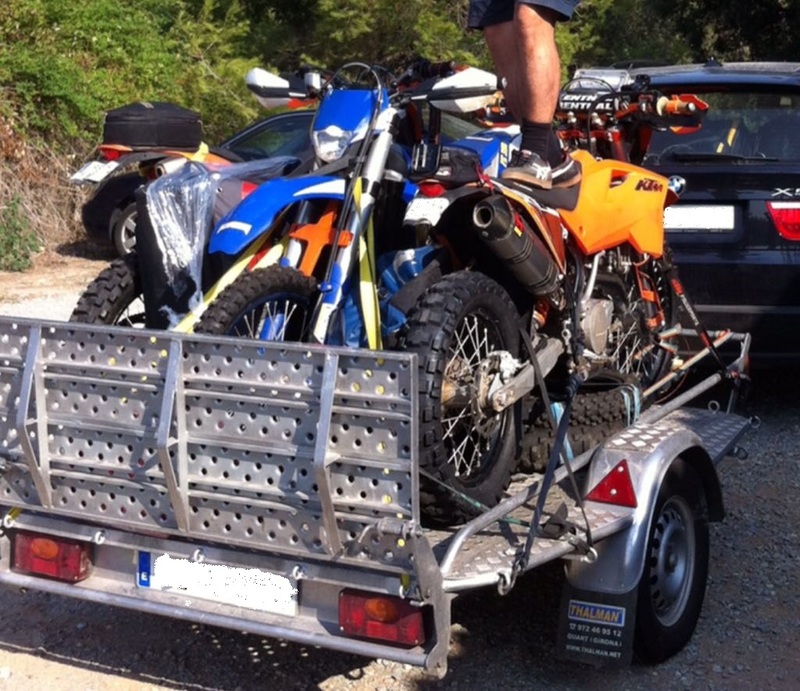 Then Gerard remembered that his family have a trailer in his hometown – not a trailer for motorbikes, but a big one nevertheless, big enough to take three trail bikes. Not the kind to be easily discouraged, we rode halfway across the country to see the trailer and test whether the bikes would fit on it. If they did, then we could consider fitting a trailer hitch on my car and splitting the cost among the five of us. The trailer was big indeed, but definitely not designed for motorbikes. It was quite high and did not have a ramp, so we had to improvise. Gerard provided an old desk that looked sturdy enough to support the weight of my bike (the biggest one) and I got it up the improvised ramp using the throttle and clutch while walking next to it, with the rest of the guys holding its back. Once we got it on the trailer, it became clear that there was no way three bikes were going to fit in there. That would have been the end of the trailer story, but a friend of mine offered to us his, which is specific for bikes. With our hopes up again, I went to get a quote for fitting a trailer hitch to my car and, to my dismay, it was a lot more than we had anticipated. Not only that, but there would be the extra cost of homologation, including a trailer in the insurance policy, the paperwork and having an extra license plate made. On top of that, the trailer is designed to fit three bikes, but of a smaller kind – endure bikes, race bikes… we had no guarantee that it would be able to take three big trails. That, and the time it would take to find secure parking for the car and the trailer near the port for two weeks plus the potential cost finally put us off the idea. We also considered having the bikes sent as I did when I visited the south a couple of years ago, but the shipping costs for a two-way transport service, plus plane tickets were too high compared with fuel and tolls. Finally, I was told that there is another ferry line connecting Almeria to Melilla and Nador, which would save us about 300km, bringing the ride down to about 800. We reckoned that if we set off early we could be in Almeria by early afternoon, giving us time to have a good rest and enjoy some tapas before taking the ferry before sunrise the following day. This entry was posted in Moroccan Christmas 2016, Preparation and tagged ferry, Morocco, motorbike transportation, trailer by Kilian. Bookmark the permalink.